While the United States has long been considered a nation of immigrants, the issue of immigration has become more contentious by the day in the past few years. Whether the issue is limiting travel from specific nations in the Middle East and Africa, building a wall to deter illegal immigration on the U.S.-Mexico border and enforcing new policies regarding immigrant families with children entering the United States, or blocking immigrant caravans to the United States from Central America, conversations on- and offline have become increasingly polarized – often along partisan lines. Social media platforms appear to play an increasing role in these conversations, but there is a lack of research in the role visuals play, even though it’s frequently the visuals that catch our attention first. Visual social media platform messages—for instance on Instagram, Pinterest, and Snapchat—are more likely to affect us emotionally, but are less frequently studied, creating a gap in the field. Connecting this to the larger immigration conversation reminds us that over the past few years, the public’s attention has been captivated by now-iconic images of immigrants and refugees: from little Syrian toddler Alan Kurdi in his red shirt face down on a Mediterranean beach to the migrant mom and her children fleeing tear gas at the San Ysidro border crossing. 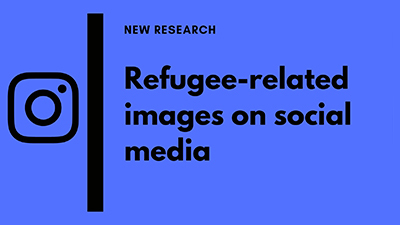 Our Page Center-funded research study asked if visual type, immigration myth and message virality would interact to influence attitudes toward immigrants. We designed a message testing experiment in which participants were shown one of eight different immigration-focused, Instagram-formatted messages. The messages varied by visual type (photo versus infographic), immigration myth (immigrants contribute versus do not contribute to society), and number of likes the message had received (high versus low). The corresponding analyses, however, yielded no significant results. There are several possible reasons for this result: First, the dose of the intervention—the frequency and length of exposure—may not have been strong enough with two exposures, and the length of the exposure may not have been sufficient. This brief exposure, however, is typical for social media in general and Instagram in particular. Second, respondents may not have read the message or read it for comprehension. Third, the survey was carried out in September and October 2018, when the public conversation about immigration was potentially less intense than during the previous summer, a time of heightened risk perception and widespread media coverage of family separations at the U.S./Mexico border. Another reason for the null results may be that attitudes regarding immigrants and immigration are to change, especially in this time of increasing partisan polarization. What does this mean for immigration-focused communication, particularly on visual social media platforms? It may be that while visuals appear to play a significant role in the current immigration conversation in the United States, these visuals may mostly be persuasive for those who are already inclined to be influenced by these specific messages. Changing the conversation may need to take place at a more basic level, as a part of a broader reconciliation of today’s fractured society. This project was supported by a Page/Johnson Legacy Scholar Grant from the Arthur W. Page Center. The 2017 grants focused on digital media. For more information on this study, email Messner at mmessner@vcu.edu.